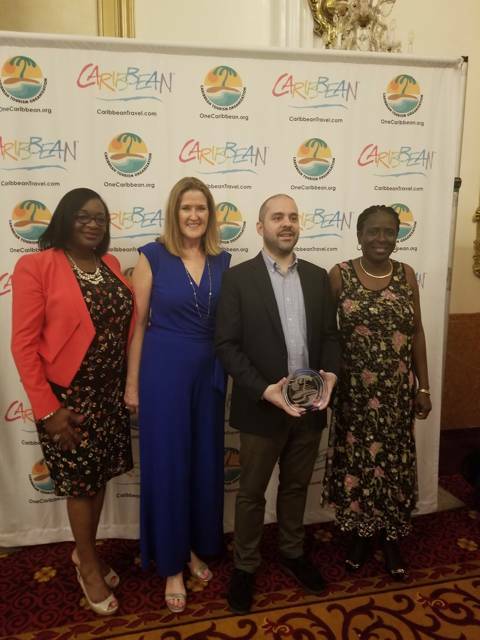 Pure Grenada, the Spice of the Caribbean was nominated in 7 categories at the glamorous Caribbean Tourism Organisation (CTO) Media Awards held last Thursday in the Grand Ballroom of the New Yorker hotel, New York City. The glitzy dinner and fashion event was held in honour of the work produced in 2017 of the Caribbean Tourism Industry. First up as a finalist was Istra Bell, a talented Grenadian blogger who wrote about her amazing day being a cocoa farmer at the Crayfish Bay Estate in St Mark’s during the 2017 Grenada Chocolate Fest. She emerged second in the category for best Caribbean blog. Also a finalist in the same category was US-based journalist Mark Rogers wrote about, amongst other things, the delightful time he spent at the Spice Market Square in the picturesque capital city of St George’s. After having an incredible time visiting the many chocolate companies in Grenada, Alexander Britell coined the island the ‘Caribbean Capital of Chocolate’ in his Caribbean Journal article. Grenada now has 5 chocolate factories that locally produce bean to bar organic chocolate. Britell was a finalist in the category, best feature in an online publication. The Grenada Tourism Authority (GTA) was nominated for its lifestyle digital campaign “Free To Wonder” which captured images of people enjoying the many sights and attractions in the destination. The cool campaign video received over 122,000 views on Facebook alone and was shared several hundred times since it was released last June 2017. The over 300 lifestyle images were liked thousands of times on social media and conveyed an easy, relaxed atmosphere with stunning scenery. Since then the GTA’s Social media platforms have grown by more than 10,000 followers across Facebook, Twitter and Instagram. Journalist Sarah Greaves-Gabbadon was nominated for her Facebook live post “Get to Know Grenada” while talking with her fellow media colleague Brian Major about the many reasons to visit the destination. Additionally, Krista Simmons’ collection of videos depicting the experiential offerings in Grenada while visiting the world’s first ever Underwater Sculpture Park, enjoying the many varieties of chocolate and chasing the over 15 waterfalls on island were featured heavily on social media. GTA Director of Sales, USA, Christine Noel-Horsford was thrilled with the several mentions of destination Grenada as a desirable place to book a vacation and visit in the Caribbean.